Probably bought by Sir William Forbes, 8th Bt. (1804-1866) for Fettercairn House, Kincardineshire, and by descent to Miss Kate Somervell. Sir William Forbes and his wife Lady Harriet Kerr employed William Burn to enlarge and remodel Fettercairn House in the late 1820s and are thought to have acquired Regency furniture for the house at that time. 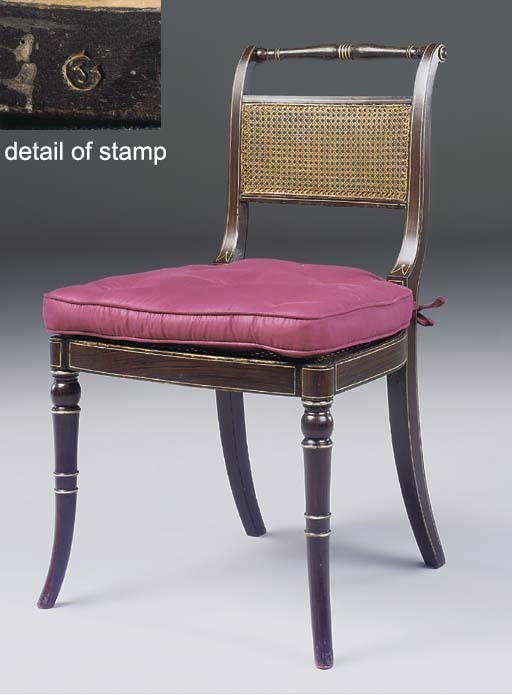 A closely related suite of chairs are likely to have been acquired by William Harry, 3rd Earl of Darlington and later 1st Duke of Cleveland , (C. Gilbert, Pictorial Dictionary of Marked London Furniture 1700-1840, Leeds, 1996, p. 221, fig. 389). The latter also bore the brand of John Gee (fl.1779-1824) of Wardour Street, 'Chairmaker and Turner in Ordinary to George III'.